Woodcut illustration highlighted for matching. 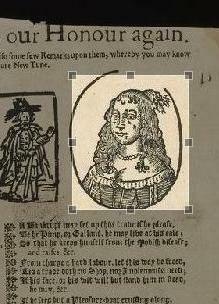 Supported by the John Fell Fund, the project “Engaging with early modern print culture online” has been developing innovative techniques for searching and comparing woodcut-printed images in early English broadside ballads. An experiment with image matching software was conducted as part of this project. The Bodleian Libraries hold over 25,000 ballad sheets which are accessible online through the Bodleian Broadside Ballads database. Over 1,600 of these are from the 16th and 17th centuries and typically feature a single song accompanied by several woodcut images. As with any hand-printed material, the letters of the type and the woodcut images are physical clues to the origins of this often undated, unattributed material. Some woodcut blocks were reused again and again until they wore out. Images were copied with varying degrees of exactness. Book historians use the presence of the same woodcut image across different printed texts to explore visual traditions and to identify the business relationships between printers who might inherit or share woodblocks. Within this project, technology developed by the Visual Geometry Group at the University of Oxford’s Department of Engineering Science has been applied to a sample of almost 1000 early printed ballads. The image-matching tool works by comparing a subpart of an image with all others in a database; finding regions that are common to both; and returning a sequence of images in order of similarity with the selected image. It can find images printed from the same wooden printing-block with a high degree of accuracy, even when the block has undergone considerable wear and tear. It can also identify copies made by tracing or by freehand imitation, even when the copy is a mirror-image. For researchers, this technology offers a promising means of grouping the woodcuts to explore their bibliographic history or compositional similarities. It can assist cataloguers in determining if images are derived from the same block, or if they are looser copies. More casual browsers will find the technology an engaging way of browsing collections without prior knowledge of their contents. For all users, it is potentially a new way of exploring the rich visual traditions of early-modern print culture. This work has been carried out by Andrew Zisserman and Relja Arandjelovic of the the Visual Geometry Group,University of Oxford.